Mahindra's pickup - with a new-generation, 4-cylinder clean-burning diesel engine - has been rated at 19 mpg city/21 highway by the EPA - well below the company's 30 mpg target. 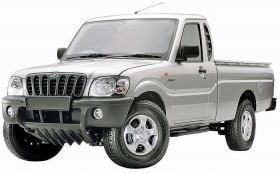 Global Vehicles U.S.A. Inc., the Alpharetta, Ga., company fighting to retain import rights to Indian-made Mahindra pickups, has withdrawn its legal demands in U.S. court. Separately, the Indian automaker has been dealt an apparent marketing setback by getting a U.S. fuel economy rating of 19 mpg in the city and 21 mpg on the highway - far below the 30 mpg promised to dealers. The legal move could be seen as an olive branch between the battling automotive companies. By withdrawing his complaint in U.S. District Court in Atlanta, Global Vehicles CEO John Perez is letting a British arbitration panel have sole say over whether he will be Mahindra & Mahindra Ltd.'s U.S. distributor. Last summer, alleging that Mahindra was preparing to maneuver him out of their distribution agreement, Perez sought British arbitration, as required in his contract. But he also filed a federal case in Atlanta to force Mahindra to press ahead with its U.S. launch while the overseas arbitration was in progress. Court documents filed last week in the Atlanta case indicate that the arbitrators in London insisted the U.S. case be dropped before they would rule on Perez's complaint. On Feb. 8, the U.S. case was granted a stay in legal terms, meaning it was withdrawn. A British arbitration tribunal is to take up the dispute in August. The Mahindra import deal collapsed last summer after Global Vehicles spent more than three years assembling a U.S. retail network of 350 Mahindra dealers. The market launch had been held up pending U.S. regulatory approval of the diesel-powered pickup. But just days before the EPA approved the pickup for sale here, Mahindra declared its deal with Global Vehicles had expired. Mahindra has since said it will make other arrangements for U.S. distribution. Mahindra officials and Global Vehicles have been telling U.S. retailers that the compact truck, with its new-generation four-cylinder clean-burning diesel engine, would offer a fuel economy of about 30 mpg, setting it apart from other U.S. pickups. Instead, the EPA has rated the vehicle at 19 mpg city/21 highway. Perez referred questions about the fuel economy to Mahindra in India, which has been responsible for technical and regulatory aspects of the truck. A Mahindra spokesperson in Mumbai did not respond to questions about the matter. The discrepancy may be a matter of which truck was tested. Mahindra plans to introduce two versions of the truck: a two-door, two-wheel-drive version, and a four-door, four-wheel-drive version. The four-door version with an automatic transmission gets 40 percent worse fuel economy than the two-door, Perez said. Mahindra provided the four-door version to the EPA for the initial fuel economy rating. In a comment today to Automotive News, Perez maintained that the two-door truck will live up to its promised fuel economy in the 30-mpg range.